1/2 cup fresh squeezed lemon juice, not from a bottle! 2 garlic cloves, minced, not from a jar. 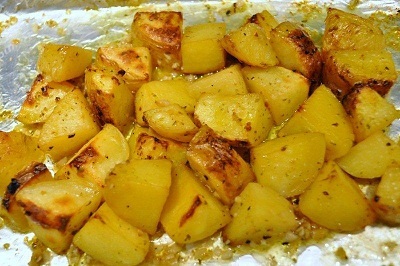 Put the potatoes and marinade in a large casserole, preferably a white glass dish, approximately 13 x 9 x 3 oval. Keep in mind that this is just a basic recipe – it’s great to add more vegetables and try different seasonings (a little balsamic vinegar, less chicken stock and more lemon juice, more or less garlic…. ) Just remember, it’s all about the INGREDIENTS. Keep them classy!